Each potential customer is different, and will want to buy your product or service for slightly different reasons. Find out as much as you can about the company or client – name, history, background, image, sales potential. Study their advertisements, their stationery, their website and anything else which will give you information about them. You will have to fit into their image of themselves. For example, if when speaking to you or writing to you they have automatically called you by your first name, you know they will want the same approach from you. If their stationery is of top quality, and correspondence is well written and presented, it will tell you a lot about the client’s or company’s image of themselves. It will tell you, for example, that they or their employers invest time and money in creating a high-quality product or service. They will expect you to do the same. Remember to take with you samples, leaflets, models – anything to enhance your own presentation. Take your business card and your diary, for future appointments. Remind yourself of how this particular meeting was generated, especially if you have several calls to make, and have the names of the people you are going to meet firmly in your mind. Set yourself an objective for this particular meeting, which might be one of several. For example, if this is your first meeting, your objective might be to set a date when you can demonstrate your product or meet the real decision maker. If it is a later meeting, your objective might be to clinch the sale. Do not expect to achieve everything in one meeting, particularly if you are after a sizeable contract, but do try to achieve the objective you have set yourself. For a first meeting, the way you approach your potential client or customer is very important. Unless you are meeting on neutral ground, you will be entering your customer’s territory. Take note of whoever greets you: build up a friendly relationship with receptionists, secretaries and any other ‘support’ people. If you are visiting people’s houses, remember to greet other members of the household if you meet them. Remember in both cases to say thank you for any refreshments provided. These people are all part of your customer’s background and team, and can often be a help to you in the future. Take note, too, of the environment. Is the place smart, tidy, fashionable, upmarket, disorganized, scruffy or what? Make allowances for working conditions in, say, a factory or warehouse and match your approach to the environment in which you find yourself. A chaotic place of work might mean a chaotic way of doing business. This is not to say that you must lower your standards in any way, but you should try to attune yourself to your customer’s ambience. 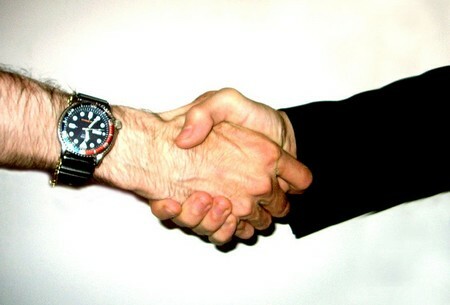 Once you have greeted your customer with a handshake and called him or her by the appropriate name, you will probably be expected to make the opening remarks. It is useful to be able to refer to a letter you have written, or a leaflet or sample you have sent; have a spare copy handy in case yours has got mislaid by your customer. Do not at this stage try to go through all the good things about your product or service; it is very tempting to reel these off, but you might not be meeting the needs of that particular customer. Before trying to sell your product or service, you must establish what those needs are.